If the project is approved, a 700% increase in tar sands tanker traffic in the Salish Sea could spell the end for already-endangered Southern Resident Orcas. There are only 74 of these orcas left – will you join the fight against tell the NEB to cancel Trans Mountain and give their survival a fighting chance? Hundreds of thousands of letters, emails, and faxes. Tens of thousands at public demonstrations. Hundreds arrested. Protect the Orcas. Uphold Indigenous Rights. Safeguard our climate. Join the campaign against the Trans Mountain Pipeline. 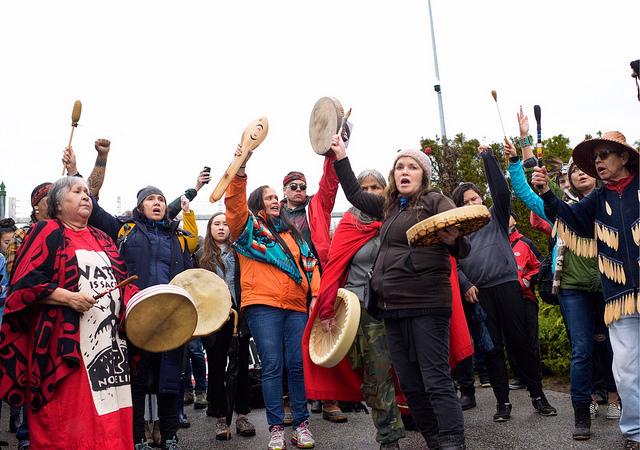 If approved, Trans Mountain would violate the rights of Indigenous peoples living along the pipeline & tanker route. Already courts have found that the Canadian government failed its duty to consult impacted Nations.